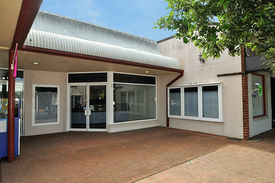 1 Commercial Real Estate & Properties in Urunga are listed in 1 categories. We have 1 OfficesLease . Located in Bonville Street next to news agency and bakery this shop presents a wonderful opportunity. It has direct street access and great exposure. Additional key features of this retail space are: Approx. 90sqm Existing fitout Suitable for retail or professional practices Large window space and display cases for advertising Existing light box Own amenities On site parking at rear Two entrances GST and/or outgoings may be applicable For further details contact exclusive sales and leasing executive; Denis Gleeson: M: 0417 414 033 P: (02) 6659 9888 E: denis@theedgecommercial.com.au The Edge Commercial...your local commercial, industrial and retail property and business sales experts.